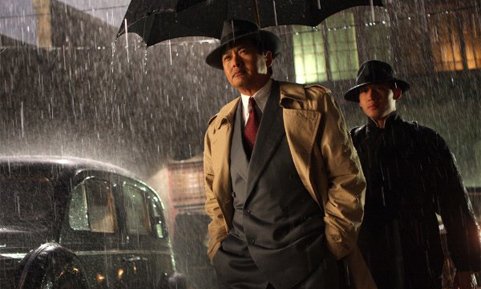 As old Shanghai is getting more and more popular, so do movies about the period. Following the steps of “Empire of the Sun“,” Tian Tang Kou” and “Lust caution“, this Hollywood old Shanghai movie comes with very high expectations. Recently presented at the Shanghai International Film festival, it is already shown in theaters in Shanghai but will only see its debut in America in September. Just like the Majestic theater was the perfect setting for viewing a 1930’s themed musical (see post about 42nd street), the best place to see the an Old Shanghai movie is surely the Grand Theater on People Square. John Cusack plays an American agent posing as a pro-Nazis journalist coming from Berlin. He comes to Shanghai after the death of his best friend, killed in the Japanese controlled area. Reaching Shanghai just before Pearl Harbor and the invasion of the International Settlement by the Japanese troops, Cusack finds himself in a love triangle with Gong Li and her husband played by Cho Yung Fat. Chased by General Tanaka played by Ken Watanabe, they will go through all the trouble to find the murderer and help the resistance against the Japanese invader. The movies mixes a number of genres such as spy and gangster movie, romance and historical movie. Although not filmed in China but in Thailand, it captures perfectly the atmosphere of Shanghai. Quite a number of scenes are taken under a pouring rain that will be familiar to people actually living in the city. With its film noir atmosphere, it create a kind of wet version of Casablanca perfectly matching the dark image of the period. The Shanghai created in the movie is also pretty good from a visual and historical point of view. The scenarist and set makers have clearly make their homework and there is little in the movie that does not fit right in the look or the history books. Shanghai, the movie is not the only large scale movie based on this period. 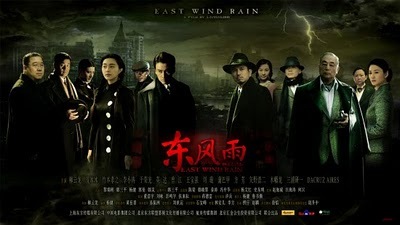 “East Wind, Rain” also takes place in the same background, with spies acting betwen Kuomintang and the Japanese army. The 4 minutes long introduction session is superb, including the re-created dog race just like that one that existed in the French Concession on Rue Cardinal Mercier (Now Shaanxi lu, the building was used as a flower market until being teared down a few years ago). A lot of attention was given to make the movie look good, however the action is far to slow not making the movie really interesting beyond the pretty introductory scene. As a movie, Shanghai is just so much better. Any body growing up in old Shanghai remember seeing the comic strips (manhua) called “The Adventures of Sanmao the Orphan” by Zhang Leping? How often was it published and how was it received by the different sectors of Shanghai? Thanks for your comment. San Mao is still around in Shanghai. I will make a post about it at some point. bien que j’admire ton travail remarquable de documentation et d’animation de l’histoire de vieux shanghai, je te propose de vérifier et de corriger le cas écheant: La rue du Cardinal Mercier, c’est Maoming Lu, certes très proche du canidrome (à l’est) alors que Shaanxi Lu, adresse officielle du canidrome c’atait la rue du roi albert.